Thank your guests with this Bat Mitzvah note card. 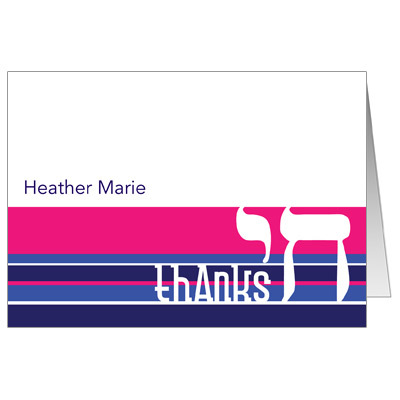 Printed in pink, purple and blue stripes on the bottom edge with the Chai symbol and the word thanks in white. These thank you cards are sure to bring good memories of your Bat Mitzvah party. Personalize with your child's name in purple. Folded card measures 5x3.5.